For the past twelve months since her parents’ death, seventeen year old Miranda Sun has harboured a dark secret, a secret that has strained the close relationship she once shared with her older sister, Lauren. In an effort to repair this broken bond, Miranda’s grandparents whisk the siblings away on a secluded beach holiday. Except before Miranda gets a chance to confess her life changing secret, she’s dragged underwater by a mysterious stranger while taking a midnight swim. Awakening days later, Miranda discovers that she’s being held captive in a glittering underwater city by an arrogant young man named Marko... The King of this underwater civilization. Since losing her parents in a horrific accident almost a year ago, Miranda Sun is hopeful that her two week summer vacation at her grandparents beach shack, may just be the perfect opportunity to reconnect with her older sister Lauren. Lauren has barely spoken to Miranda since they had lost their parents, not counting the snide comments about Miranda's weight under her breath. With only a week to go until her birthday, Lauren is slowly beginning to allow Miranda back into her life, when tragedy strikes. During a midnight swim, Miranda is dragged under the water by something wrapped around her ankle, until she feels two hands drag her further down. Kicking and struggling for air, the last thing Miranda remembers is the facial stubble of a stranger, his lips... And then the world went black. Miranda wakes up in a foreign bedroom with a lone male in the corner, seemingly watching her sleep. He refuses to provide any answers, until a woman he refers to as Sylvia arrives. Greeting her captor simply as Robbie, Miranda pleas for her freedom, only to be denied. Sylvia is the lone sister to Marko, king of Marin. Miranda has no choice but to tell her captors her name, or a name will be provided for her. Deciding that Miranda is of no use to the king until she comes of age, Sylvia insists that her well being and safety is to be entrusted to Robbie. She prays that Lauren and her grandparents haven't given up hope of finding her. She needs to find a way to escape. But escape seems impossible when you're trapped in what seems to be a windowless bunker, with only an air vent to circulate oxygen. Where is Marin? Although Miranda was taken to save Marin and it's civilization, Marko doesn't seem to be interested in her at all. When Robbie had taken her, it was at the request of Sylvia and a royal guard must follow orders. But it isn't her captors that she needs to be weary of, the third sibling and Sylvia's twin brother Damir believes he is the rightful heir to the throne that Marko occupies, unless Marko produces an heir. Miranda's fate decided when she was chosen at random, and with no chance to escape the underwater civilization alone, her only option is to befriend Robbie and be thankful that Marko has taken a dislike to her. But regardless of his repulsion towards her, Marko's duty is to the people of Marin and the expectancy of marrying and producing an offspring. If only Sylvia didn't threaten Miranda's non compliance with a gruesome death within the city's Colosseum. Marin was founded by the siblings grandfather while searching for the elusive mermaids, and had discovered the underwater kingdom. Building the population from inhabitants on the surface. Money, power and discretion ensured that the new residents of utopia were silenced, with the lure of the kingdom eventually compelling them to stay. But after three generations of women have become barren, Miranda is expected to not only be fertile, but proudly willing to give the city the first child born in eighteen years... If Damir doesn't reach her first. Miranda's only means of escape, is through the exit in Marko's bedroom, conveniently. But as she spends time with him in order to gain access, she finds that she and Marko have more in common that she cares to admit. It doesn't help that he's not only attractive, but treats Miranda as though she's beautiful, something that Miranda's low confidence won't allow her to believe. Her friendship with Robbie blooms into something far deeper than Miranda should feel for her captor. But as Robbie agrees to help her, Miranda starts to wonder if there is anything in her world to return to. Perhaps Marin is her chance to start again. 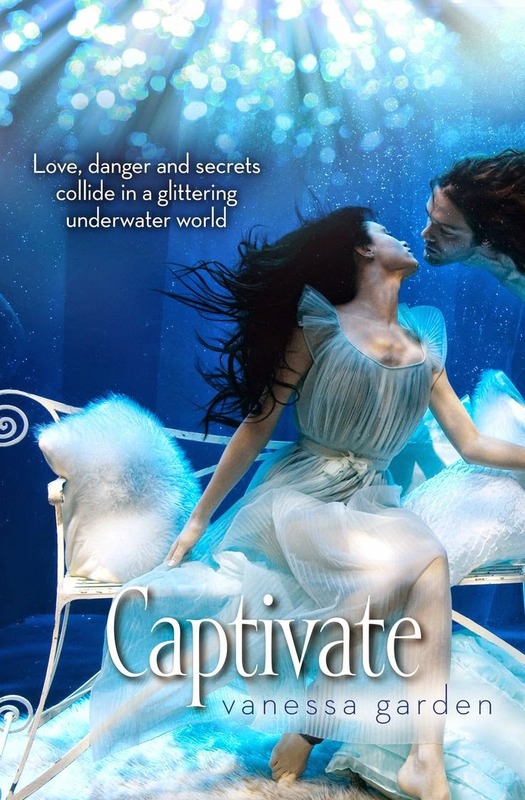 Captivate tells the story of a magical underwater world, that is as close to perfection as humans will experience. Ruled by the charismatic and gentle hearted Marko, who is under pressure to produce an heir with a foreign girl that he finds himself falling in love with... And he isn't the only one. Captivate is a science fiction romance, rather than fantasy, as the citizens that live within the lost underwater world are actually human. Some born within Marin and some taken, just as Miranda was. It's a fun, light read which is perfect for the Australian summer. Vanessa Garden has created a perfect underwater world where readers can escape and submerge themselves in the magic. Yay an underwater romance that isn't filled with cliches? This one actually sounds quite magical and captivating. Thanks for your lovely review Kelly!